This strawberry cheesecake salad is a wonderful low carb dessert! 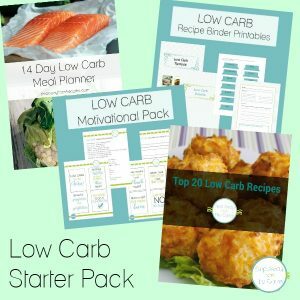 Sugar free, LCHF and keto recipe. 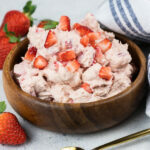 This recipe is a variation of my Low Carb Strawberry Cheesecake Ice Cream! I’ve just made it into salad form, and is a wonderful dessert for anyone following a low carb, high fat diet. Watch my recipe video tutorial or scroll down for the full instructions and a printable recipe card! Add cream cheese and heavy cream to a stand mixer. I use reduced fat cream cheese, because as you’ll see from my comparison it makes no difference in carbs, but is better for anyone else in my house who wants to share the dish! When it has combined, add more heavy cream. 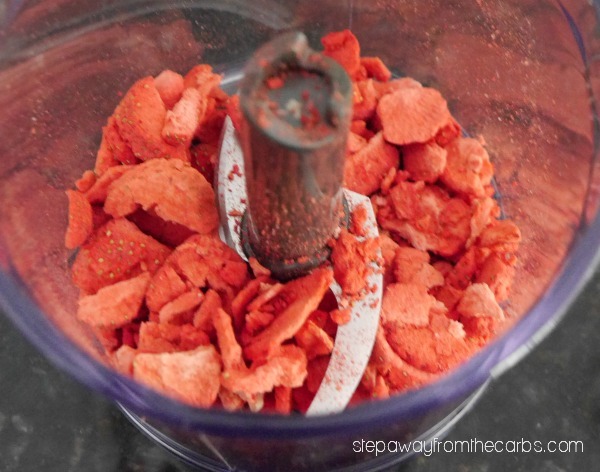 Too add extra flavor and sweetness to the salad, I crushed up some unsweetened freeze dried strawberries into powder using the blade attachment of my stick blender. I get my strawberries from Nuts.com but you could also get them from Amazon or LC Foods. Add the strawberry powder to the cream mixture, plus some sugar free sweetening syrup (although you might not need this if your strawberries are super sweet). You could also substitute a few drops of liquid stevia or low carb liquid sweetener of choice! Mix until fully combined. Hull and chop some fresh strawberries. As ever, my handy huller tool makes this a quick task! Add the strawberries and some almond flour to the cream mixture and stir by hand. The almond flour gives the salad a subtle nutty flavor. 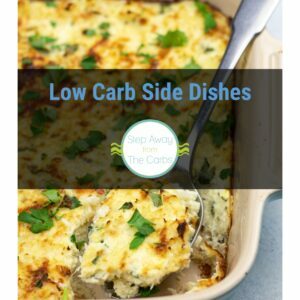 Spoon everything into a serving dish and keep in the fridge until ready to serve! Place the cream cheese and HALF the cream into a stand mixer bowl. Mix on a slow speed until combined. Add the remaining cream and mix again. Add the freeze dried strawberry powder and sweetening syrup and mix until fully combined. Add the fresh strawberries and almond flour, and stir by hand until well mixed. Spoon into a serving dish and keep in the fridge until required. What other flours can you substitute with. Can’t do nut or coconut. Would sunflower work? I’ve never tried sunflower flour I’m afraid! If you try it please let me know how it goes! 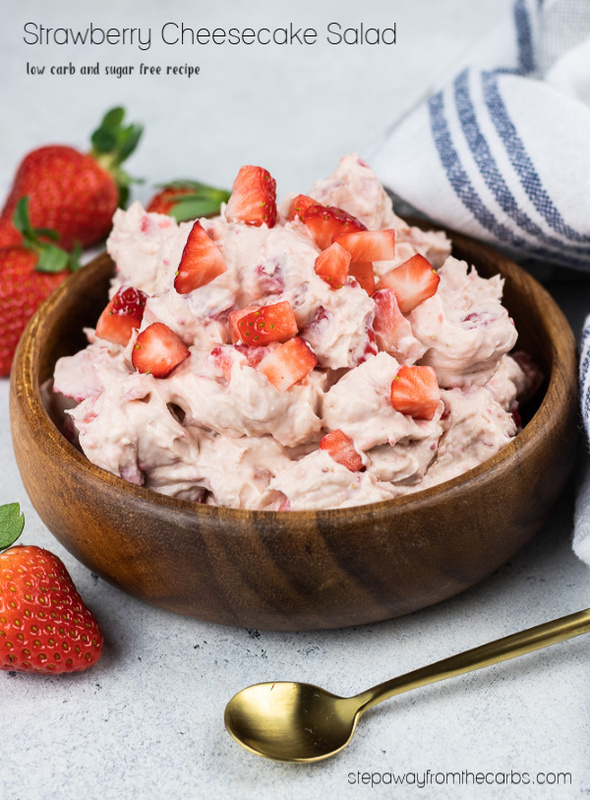 Can you use fresh strawberries instead of the freeze dried? I personally like the combination of both, but if you try it with just fresh please let me know how it turns out! Yes! Blueberries would work really well too!! What about trying sugar free gelatin powder? Instead of freeze dried ? It might get too sweet – and not everyone can have the sweetener in sugar free Jello. But if you try it, let me know how it turns out!